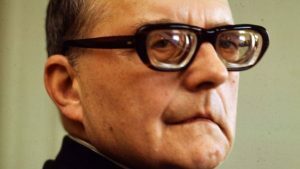 To all appearances, this period of Russian music was dominated by the work of Shostakovich – and, judging by the succession of masterpieces which flowed from his hand, he seems to have thrived creatively in the less repressive years which followed Stalin’s death. Of course, the real picture was far more complicated as composer and state continued their uneasy cat-and-mouse game. Also, though, there are a number of lesser-known but significant composers whose music is well worth exploring: a first group who were roughly contemporary with or slightly younger than Shostakovich, and a second, more radical group who emerged during the 1960s and 70s. Schwarz, Music and Musical Life in Soviet Russia: 1917-1981. London, 1983. Tsenova, Underground music from the former USSR. London, 1998. L.E. Fay, Shostakovich: A Life. New York, 1999. MacDonald, The New Shostakovich. London, 1990. Volkov, Testimony: The Memoirs of Dmitri Shostakovich. London, 1987.Wilson, Shostakovich: a Life Remembered. London, 1994. Six weeks, starting 6th November-11th December, 2017.